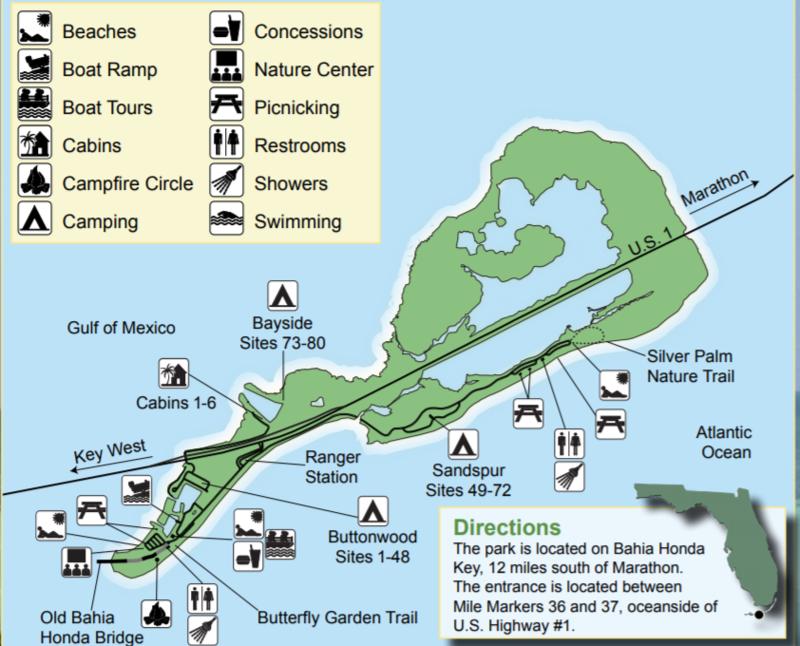 Bahia Honda State Park is not the typical state park. First, it is a fairly sprawling parcel of over 500 acres of protected land among the Florida Keys, nestled between the Atlantic Ocean and the Gulf of Mexico. The waters are crystal blue and during the summer months, sauna warm. Second, it is remote. 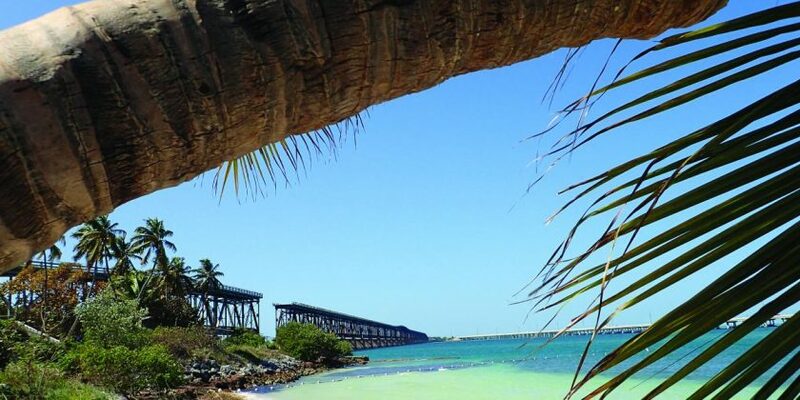 In terms of Florida travel, RVers will enjoy a scenic drive to a final destination situated within Boot Key, No Name Key, and Big Pine Key, all of which reside just 12 miles or so from the southernmost tip of the Keys. When it comes to RV camping, it does not get more southern than this. Third, in spite of it being so remote, it is pleasantly nestled within some of the most active and luxurious travel hot spots in the country. World-renown beaches, sightseeing activities, and restaurants abound. For RV campers wanting to get away from it all yet still have the option of succulent dining and awe-inspiring experiences–Bahia Honda State Park is the choice. Campers can choose from over 40 RV campsites capable of accommodating rigs between 20 and 64 feet in length. Each site is fitted with access to water hookups and 20-, 30-, and 50-amp electrical connections. Campsites 30 through 40 are generally in private woods setting. Sites 15 through 26 are situated near the beaches. All offer quick access to two Gulf of Mexico boat ramps. Within the park, campers will find dining options and concessions. The visitor center allows people to learn about the area’s history and stay informed of upcoming events held at the amphitheater. Events at the amphitheater often occur at night, after the park closes. As such, they are reserved strictly for camp guests, an exclusive option for RV campers and other campground guest that helps create a unique resort members-only experience. Standard amenities include campgrounds, boat launch, and picnic pavilions. Unique amenities include interpretive exhibits and cabins. Shower stations and restrooms are centrally located. One of the best aspects of the park is that it is pet friendly, allowing families with dogs or cats to enjoy everything it has to offer. Few state parks can claim to offer resort-grade experience, but for RV campers looking for such experiences, Bahia Honda State Park has plenty. One thing about the park–light pollution is almost non-existent. Consequently, in the Keys, within the park, stargazing means something entirely different than it does anywhere else. Friday night events include star gazing with members of the Florida Keys astronomy club, of which the park ranger is a member. In fact, for star gazers, the Bahia Honda State Park is the absolute darkest place in the Florida Keys, allowing keen views of the Milky Way and other astronomical wonders. The park is known for its access to the coral reefs lining the Keys. The water is clear, allowing visibility extending up to 80 feet. That said, anyone interested in seeing the reefs is encouraged to consult the daily diving weather report as winds and choppy weather can obscure the waters. Snorkel tours are a must-do activity. Offered by the Coral Reef Park Company, tours are held twice per day and last approximately 1.5 hours each. Snorkelers can purchase under-water cameras for memories on the go. Of course, RV campers can enjoy all the amenities of home within the comfort of their motor home, but they are highly encouraged to set aside a night for boat camping–yes, camping in boat. Camping boats, or platform boats, as they are called, offer people the opportunity to enjoy a night on the water. They are often not extremely luxurious, and they are not intended for lengthy water trips. Instead, depending on the rental facilities, they offer daytime fishing opportunities and on-the-water accommodations. For people interested in a night on the water to enjoy unobstructed views of the ocean and sky, boat camping is a unique, exhilarating experience. 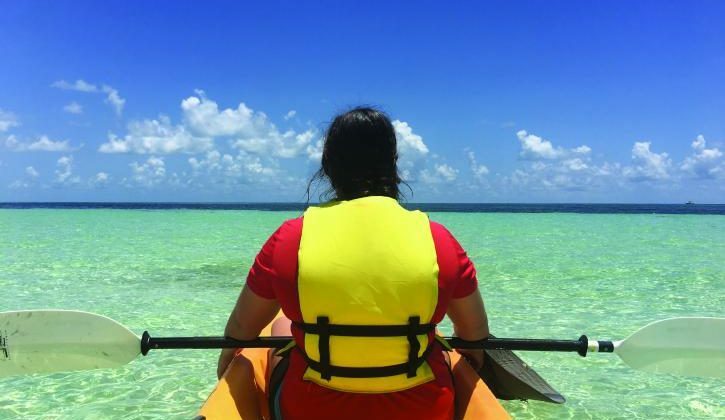 For campers with a tow vehicle, visiting the southern tip of the Keys is a must. For campers relying on the RV as their primary vehicle, there are a host of restaurants and marinas to accommodate large vehicles. Of these, only a few miles away, Geiger Key Marina is a top choice. Fresh seafood of the day is the specialty. Because of the fantastic views, diners are encouraged to dine outside at one of the many picnic-tables. Of course, being in the Keys, even so-called “inside” dining is outside, with the bar and stools and tables situated beneath a cool, shady awning. For more information, visit floridastateparks.org, bahiahondapark.com or call 305.872.2353.